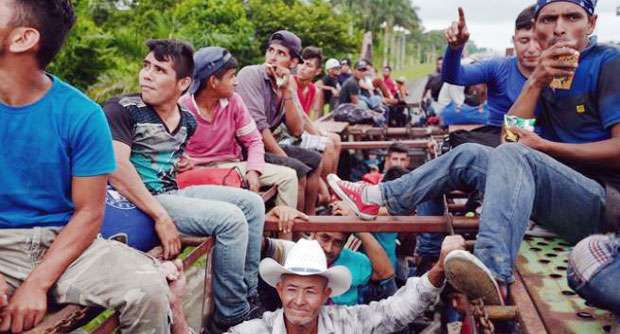 Just days ahead of the midterm elections, US President Donald Trump is seeking to change regulations so that people cannot illegally enter the country then apply for asylum and live freely while their case is processed. “Migrants seeking asylum will have to present themselves lawfully at a port of entry,” Trump said on Thursday at the White House. He said an executive order would be issued soon. “Those who choose to break our laws and enter illegally, will no longer be able to use meritless claims to gain automatic admission into our country. We will hold them for a long time if necessary,” Trump added. The president said families detained would be held together, and focused on ending what he called “catch and release” of undocumented migrants. Critics accuse Trump of stoking racial tensions with his campaign against illegal immigration, which has been coupled with a crackdown on the number of refugees admitted and a push to restrict legal immigration. He drew fresh condemnation Thursday by tweeting an anti-immigrant video implying that there were murderers among them. The video starts with footage of convicted murderer Luis Bracamontes boasting about killing police officers, and claims: “Democrats let him into our country.” It then intersperses footage of him with images of migrants trying to push through barriers. “It is outrageous what the Democrats are doing to our Country. Vote Republican now!” Trump tweeted above the video. US media quickly pointed out that Bracamontes last entered the country in 2001, when Republican George W Bush was president.